October 28, 1988. Wildcat River from the headwaters in Carter Notch to the confluence with the Ellis River (9.05 miles). Little Wildcat Brook from the headwaters on Wildcat Mountain to the confluence with Wildcat Brook (2.83 miles). Bog Brook from the headwaters near Perkins Notch to the confluence with Wildcat River (1.58 miles). Great Brook from the Route 16B bridge at Whitney's Pond to the confluence with Wildcat Brook (1.05 miles). Scenic — 13.7 miles; Recreational — 0.8 mile; Total — 14.5 miles. 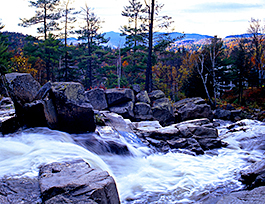 A small mountain stream that rises from the scenic White Mountain National Forest, the brook tumbles over a series of ledges into the center of the classically picturesque New England town of Jackson. The area has many hiking and cross country skiing opportunities. The outstanding scenic beauty, high-quality water, and recreational value of the river area and Jackson Falls provided a centerpiece for the historic resort town, as Jackson evolved from its agricultural origins a century ago to the rural, tourism-based resort community that it is today. Still, white winters, subtle shades of spring green, lazy summer days, autumns lit with color, rivers in the Northeast showcase the seasons.